That was me as I tried to get a photo of the Wildflower Wednesday plant of the month Smilax bona-nox and its thorns dug into my coat and smacked me in the head. I have mixed feelings about many plants and this one is clearly in the "why, oh, why do you keep showing up in my garden" category. 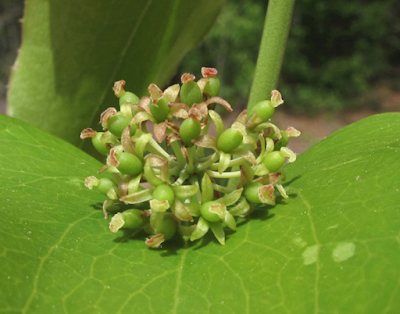 Smilax bona-nox is a species of flowering plant in the Smilacaceae, or Greenbrier family. Its natural range is from eastern Mexico to central Texas north to southeastern Nebraska, east to Maryland and south to Florida. 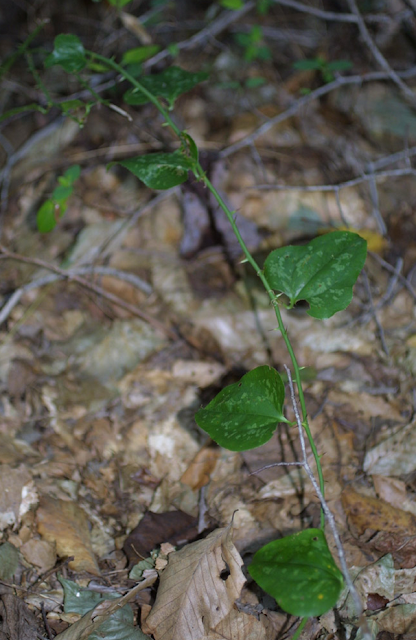 Smilax is more often a climbing vine, but, it can form a tangled impenetrable bush. It has attractive, waxy heart shaped leaves with tiny thorns along the leaf margins (top photo). Separate male and female plants are needed for fruit production. The flower is an umbel of pale green flowers and the fruit is a small black berry. The plant reproduces by seed and by sprouting from its rhizome. Another name for this native plant is saw greenbrier. The thorny vines make this a problem plant in a cultivated wildflower garden. Greenbrier seedlings pop up wherever birds might transpoop a seed. That's often near where people walk or garden. It's a hazard in my garden and needs to be dug out. Not only was it in a location that put people in harms way, the vines were pulling a small Aronia arbutifolia over. It was this vine that smacked me in the head, so down it came. 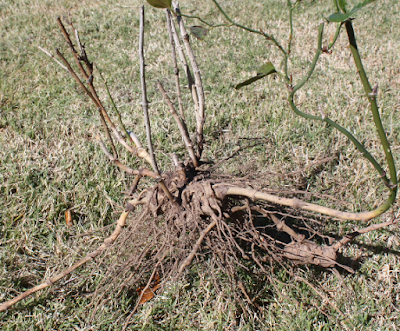 Smilax is one of those plants that must be dug out, not just cut back. It's better to catch them when they're young and easier to dig. Shoots will develop where ever there is a node creating an enormous rhizomatous root mass. It's a big job to remove a large vine. I needed help. Are there pluses to greenbrier? Yes, there are pluses to greenbrier. It has very good wildlife value. Just make sure it's not near where people will be walking or working and let it grow. It will make a formidable thicket where mammals and birds can shelter and the Gray catbird will nest. White-tailed Deer, Beaver, and Eastern Cottontail will eat the leaves. The flowers of Greenbrier are pollinated by Blue Bottle Flies. Many animals eat the berries, including: Wild Turkey, Wood Duck, Northern Cardinal, Gray Catbird, Common Crow, Northern Mockingbird, American Robin, Brown Thrasher, Cedar Waxwing, Pileated Woodpecker, Virginia Opossum, Raccoon, and Eastern Gray Squirrel. Or, you can embrace Sally Wasowski's suggestion from Gardening with native plants of the South. "Do not plant, put an existing one to use....Your task with smilax is not to coddle it or nurture it but to keep it cut back." Hmm. If we can put up with prickly rose canes we can certainly entertain the idea of a flowering and berrying greenbrier arch someplace in the garden! Smilax will grow almost anywhere. 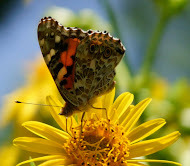 It is common in woodland understories, forest edges, fencerows and rangeland settings in full to partial sun. It's considered by many to be one of the most difficult perennial vines to control or eradicate from their gardens. What do you think? Is good wildlife value enough of a reason to have a plant in your garden? Would you try to manage it with pruning or dig it out? a bit like our Asparagus fern. Rather pretty, but don't come too close. Some plants have good looks and are dangerous! Kind of like all those spiky, thorny plants that many of my friends like to add to their gardens. I have come into contact with this brute before. I don't want it in my garden. It is an interesting plant. Brute is a great moniker for this plant! I totally get why someone wouldn't want it in their garden. There are more friendly wildlife plants that I would rather have. I've dug them up (or tried, at least) when they're coming up in the middle of a planted area. And I've pruned them back in other areas. I don't mind them in some parts of the yard where I'm not gardening but I try to keep them manageable. I have had to prune them to the ground when they come up in the middle of a planting. I can't dig out a ten year old tree to remove it so I prune frequently. I have Smilax all over the front woods. Not a favorite plant at all. I hope the puppies haven't encountered it Janet! I admit I love the heart shaped leaves, but those thorny vines are terrible if you run into them. I've heard of this one, but I don't think I've seen it much--maybe during travels but off the path, so I didn't notice it. To answer your question, yes, I believe it has a place. I would probably deal with it in a similar way--retain it in an area of my property where people and pets don't go. 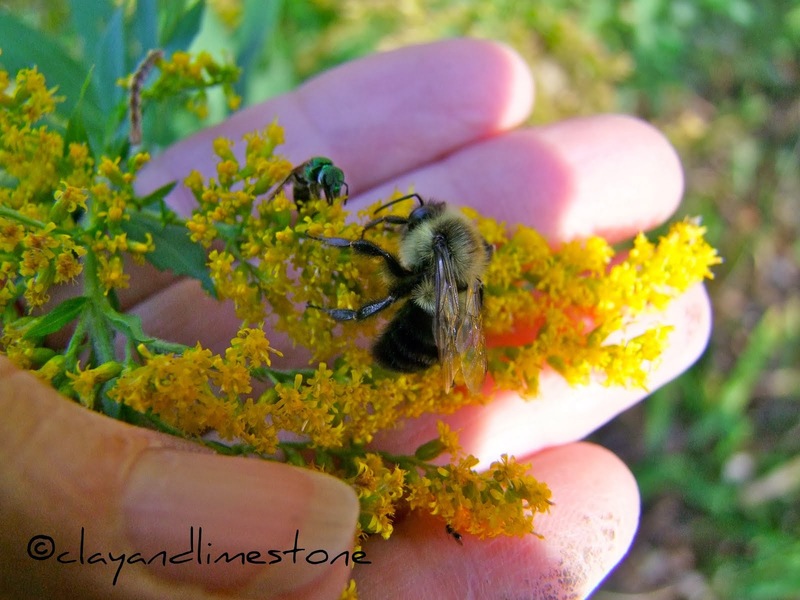 Thanks for hosting Wildflower Wednesday, Gail. I think that's a perfect compromise for a wildlife valuable plant that might be dangerous to people. Oh gosh we are inundated with it in our forest. We cut 30 foot masses of it out of the hardwood trees by our pond. For the most part we live with it but really try to avoid it when walking the forest. Hubby keeps asking its purpose and of course we have the berries and understand its value to wildlife. I allow it to remain in some areas like by my front gate to deter people and animals. In the garden it HAS to go. I will dig it out. Roundup does not work on it as far as we can tell. I asked my forester its purpose and like everything about managing the forest he had the same answer: it's part of the forest and you simply have to manage it. Good thing as it will always be here. Informative post Gail. Love it. I hope to see some catbirds this year. Me, too, Tina, I would love to see birds nesting in a thicket. I have not seen this plant but it looks so interesting. Any native plant that is good for wildlife, I can't fault. It is very interesting. I do love the leaves, but those thorns are wicked. I like to manage it and let it be in the less peopled part of my garden. I've seen this pop up in my garden beds. Hard (and sometimes painful) to try to pull or dig, as you pointed out. However, per Ms. Wasowski, I don't think I'd mind having it in an out-of-the-way corner, if I had some woods on the property. It does have good wildlife value, after all. Catbrier is another good name for it. The difference between smilax and roses is aggressive spreading....I can't imagine deliberately training one! I have fought smilax in four gardens and two zones for twenty years. It gets dug aggressively near the house, though the acreage beyond the yard is too big for such attention while I'm still working. I have heard that the tender shoots are edible...anybody tried treating them like asparagus? I have heard that, too, Magpi, also, that the tubers are edible. We have a wild rose that's very thorny that I would train on an arch, but, not saw greenbier. I will let it go in my wayback backyard. Thank you for stopping by. Those thorns look really wicked. I have some thorny roses, but I don't think I am willing to move to the next level of thorniness. I totally get that... I've been smacked by climbing roses, this feels much the same. Now there's one plant I'm glad my garden is too cold for! We call this one catbriar because of its claws. 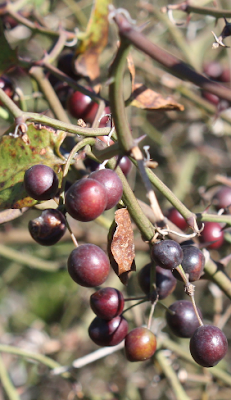 On purpose I grow Smilax smallii, which is very evergreen, thornless, and well-behaved. There is a beautiful old town in NC called Edenton, where S. smallii is a traditional Christmas green. We used that vine, when we were kids, to fence other kids out of our secret forts in the woods - our version of barbed wire.